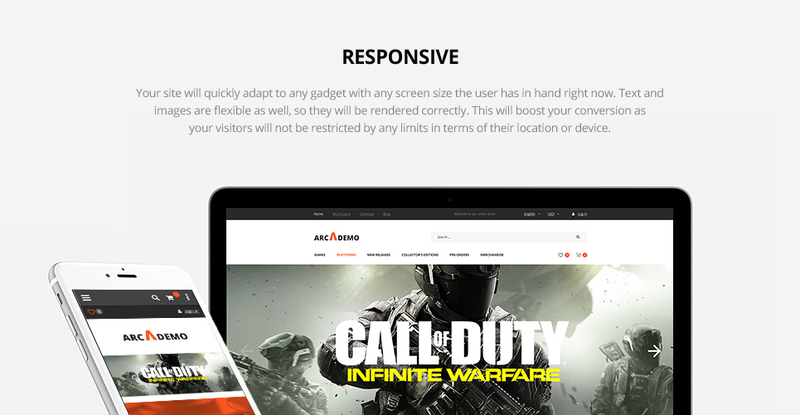 This fully responsive and well-documented theme will help you to create an outstanding video games shop! Testimonials and Team Members plugins will help you to make your website far more reliable, while a large number of UI elements allows you to add multiple types of content to brighten it up for your audience. Let your customers choose from versatile genres, developers, manufacturers, pricing, and other shopping options and let them get immediate results with a Live Search. 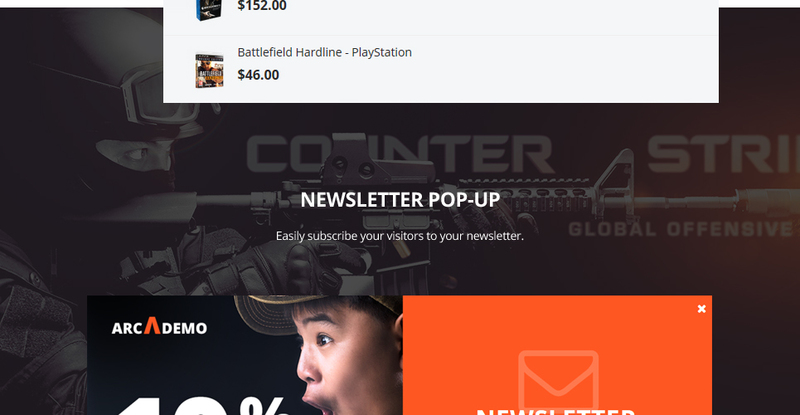 Banner Grid provides you with an eye-catching video games presentation, while star rating and quick preview will provide your clients with a reliable shopping. 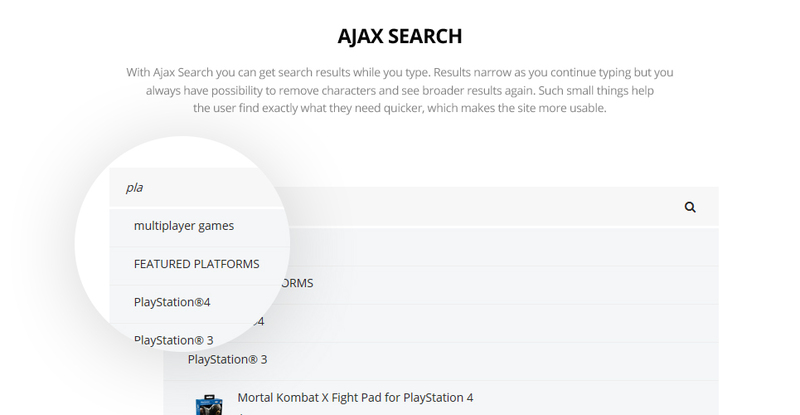 A powerful Wishlist & Compare plugin will help your customers to lay aside favorite games and compare them by necessary features. 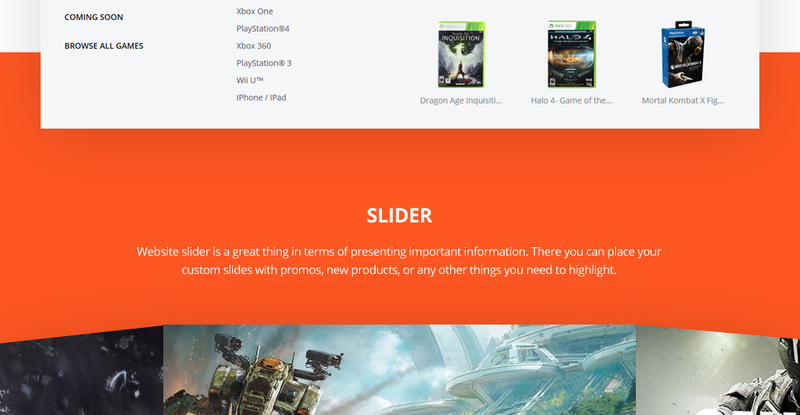 Lead in selling video games with this game portal theme! Responsive layouts adjust to scaled-down as well as the much bigger display sizes mechanically. Responsive web design allows you to strengthen user experience and offer a whole access to the website page details from any gadget. Every time a internet user types anything at all to the research bar, the major search engine looks for it depending on numerous rules. Search Engine Friendly template's code is specifically apparent and structured to try to make Search engine optimisation work more effortless. Via a SEO-friendly design templates, you will have the foundation to establish a visible internet project that can be easy-to-find with the usual keywords research. Plus, you can make your web-site rank higher in search results, thus making it much more likely that people will have a look at it. Do you provide any scripts with your Magento ecommerce themes for Games & Nightlife News or could you do some custom programming? Our templates do not include any additional scripts. Newsletter subscriptions, search fields, forums, image galleries (in HTML versions of Flash products) are inactive. Basic scripts can be easily added to a Software Company Magento ecommerce template at www.TemplateTuning.com If you are not sure that the element you're interested in is active please contact our Support Chat for clarification. Can I put a line at the bottom ( or any other spot) of the customized Magento design for Video Gear Store "Website design by Company name"? No, you cannot place a line at the bottom ( or any other spot) of the customized Magento design for Video Gear Store saying "Website design by Company name". Nevertheless, you can place "Customized by Company name". Can I get the extended license for some other pricing than the half of the initial Magento design theme for Playstation Consoles price? No. 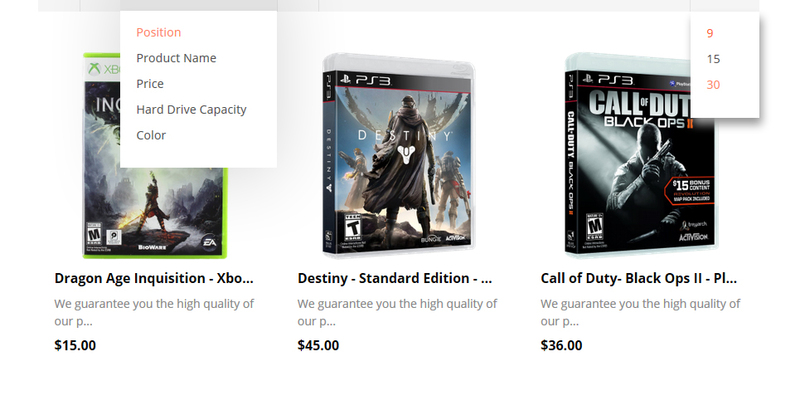 The price for purchasing license for a single Magento design theme for Playstation Consoles is the half of the template unique price. 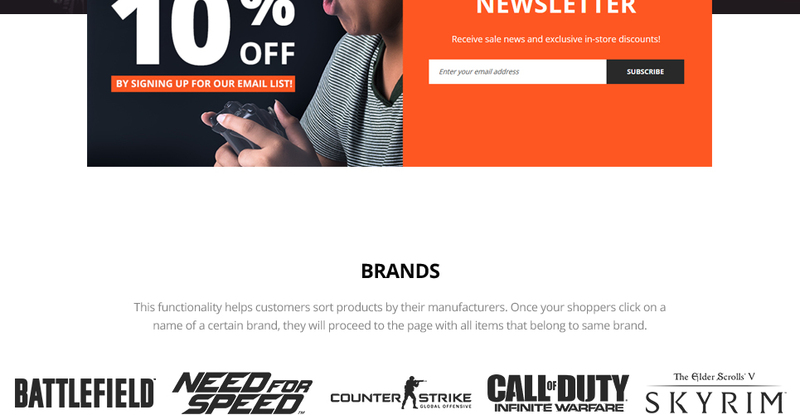 I like the image from the Games Magazine Magento ecommerce template and would like to use it for my advertising campaign, can you send me this image in a higher resolution? 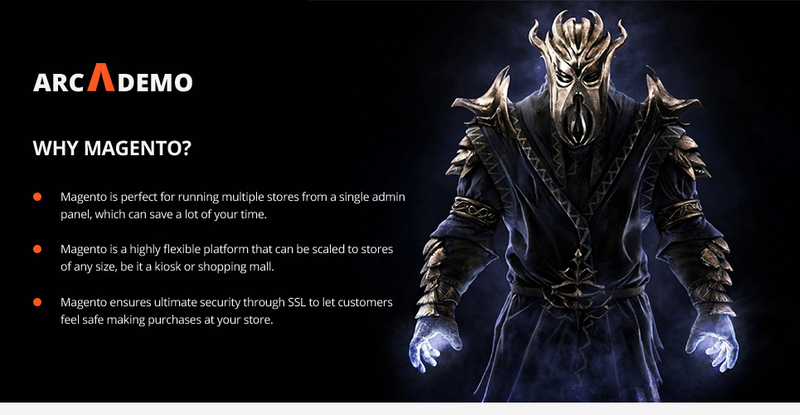 No, we can't provide image in higher size or resolution rather than it is on the Games Magazine Magento ecommerce template. We recommend looking for professional images on online photo resources. What is Developers License for Magento ecommerce template for App Store? If you purchase a Developer's license, you are granted a non-exclusive permission to use the Magento ecommerce template for App Store on up to 5 domains for projects belonging to either you or your client. What is a one time usage license for a Magento theme for Entertainment? When you buy the Magento theme for Entertainment at usual price you automatically get the one time usage license. It enables you to use each individual product on a single website only, belonging to either you or your client. You have to purchase the same template again if you plan to use the same design in connection with another or other projects. When passing files to your client please delete the template files from your computer. Are your Computer Software Store Magento themescompatible with any CMS? I have customized the Magento design for Software Engineer and would like to protect my content by copyright, can I place Copyright, Mycompanyname.com? After Magento design for Software Engineer purchase you can put your copyright to the template. But you cannot place a line at the bottom (or any other spot) of the customized project saying "Website design by Company name". Nevertheless, you can place "Customized by Company name". Can I use graphics from Magento design theme for Computers I purchased for use in printing? Yes, it's not prohibited to use the Magento design theme for Computers graphics for printed material, but the resolution of the templates graphics ( except for logo templates) is not enough for printing. Will the Game Channel Magento template be deleted from TemplateMonster database? No, the Game Channel Magento template will not be deleted from TemplateMonster database. Is it possible that Template Monster will contact my client which website I made from Template Monster's website Programming Tools Magento design? Yes, our legal department checks licenses regularly. In case we won't find designer's contact information on the site which was made from the Programming Tools Magento design of ours we will contact the owner of the site directly. How many applications, programs etc can I use to integrate with the Database Software Magento ecommerce themes under one extended license? The extended license gives you the right to use the purchased Database Software Magento ecommerce themes for the integration with one software/freeware/application/CMS/sitebuilder only. In case you would like to use the template with the other application, the other license is to be acquired. I would like to make payment for Magento design for Custom Software Development by company check. Is that possible? Please use Skrill payment option. They accept payments by check.You can place an order for Magento design for Custom Software Development on the site under the name of the company and choose Skrill merchant system for making payment from the company's account. To initiate bank transfer, please create an account here - www.skrill.com, add the number of your bank account and verify it. After that, you can place an order on our website and choose Skrill on checkout page. When the payment is made, the product will be sent to your e-mail along with the invoice under the name of your company. Make sure that these charges for Magento design for Software Shop have different order IDs. If it is so, contact our billing department. 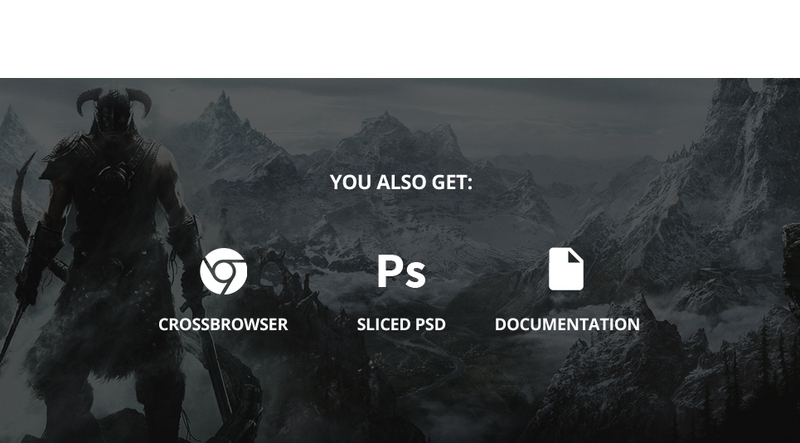 Can I resell Magento templates for Video Games I bought the developers license for? You cannot resell the customized Magento design theme for Software Company as a template, but you may sell it as a project to your client. 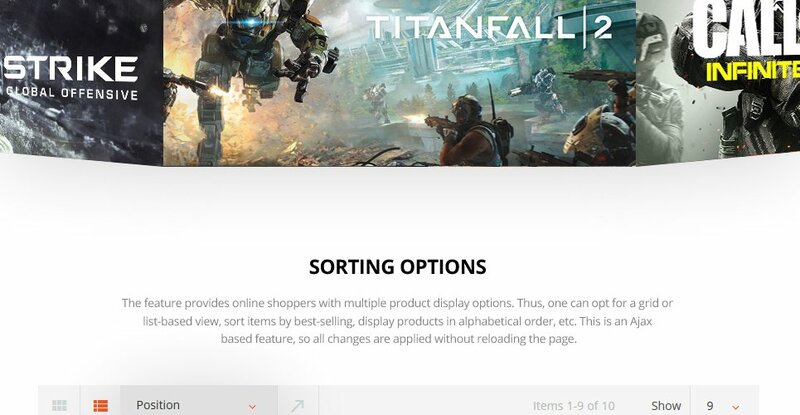 How can I modify Magento design for Video Games to suit my particular website? Please visit our Online Help Center to obtain detailed instructions on editing Magento design for Video Games. Can I put low resolution thumbnails of Magento ecommerce templates for Sports Games on my website for my clients to choose designs? Is it reasonable to make unique purchase of Magento design for Video Gear Store that was already purchased before? Yes, it's reasonable to make a unique purchase of Magento design for Video Gear Store. Because there is very small chance that you will find the same design on the net. There are more than 3,000,000,000 webpages online now according to statistics on www.google.com. What are the advantages of purchasing a Magento design theme for Computers? 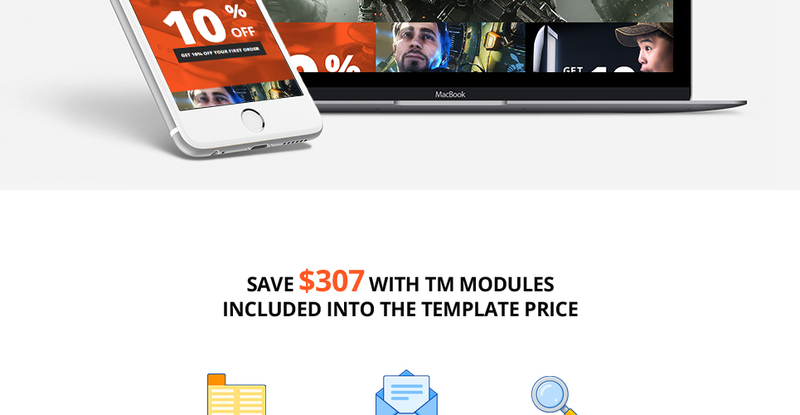 The major advantage of purchasing a Magento design theme for Computers is price: You get a high quality design for just $20-$70. You don't have to hire a web designer or web design studio. Second advantage is time frame: It usually takes 5-15 days for a good designer to produce a web page of such quality. Can I resell the customized Digital Cameras Store Magento design theme? No, you cannot resell the customized Digital Cameras Store Magento design theme as a template but you may sell it as a project to your client (see paragraph 1 ONE TIME USAGE LICENSE for more details). 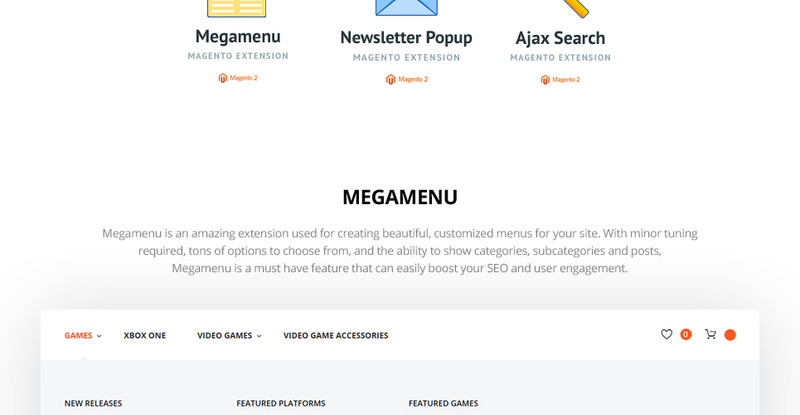 In what cases I don't need the extended license for Games Magento templates?